On Nov. 23, the Awarding Ceremony of 2018 China Universities Industrial Design Competition was held at Guangzhou Academy of Fine Arts.Multifunctional Household Sewing Machinedesigned by Zhu Boyi from Product Design of School of Applied Arts and Design won the Gold Medal in E-life Appliances section.DIY Travel Stationery Setmade by Ma Yining won the Silver Medal in Work and Study Supplies section.Medical Rehabilitation Wheelchaircreated by Xu Hongjie andWalking Aids for Visually Impaired Peopleby Qin Yifeng both won the Bronze Medals in Transport Tools section. Teachers Zhang Zhan and Mo Yiping won Excellent Guiding Teachers. All of SSPU’s works were the graduation designs by graduates of Product Design in School of Applied Arts and Design. 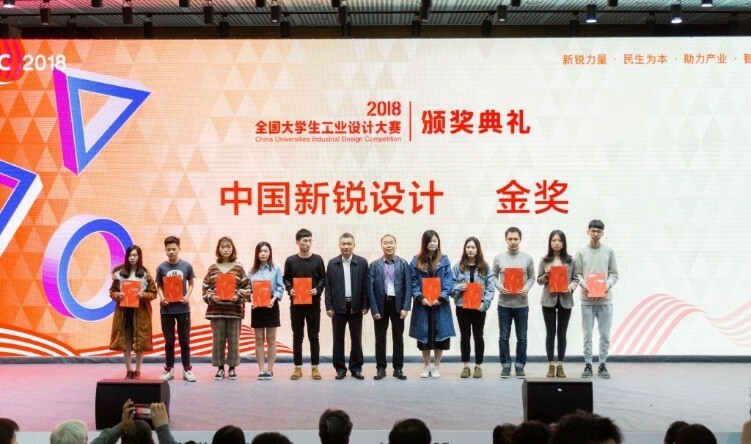 China Universities Industrial Design Competition, held every two years, is an influential event in the field of Industrial Design guided by Ministry of Education, and hosted by Chinese Industrial Design Teaching Advisory Board under the Ministry of Education. Participating the competition were over 30,000 persons with more than 40,000 designs from universities in 29 regions nationwide. There were 9 competing sections including Work and Study Supplies, Daily Supplies, Furniture, Electronic Devices, Household Appliances, Transport Tools, Clothing and Accessory, Public Design, and Interaction and Service.